JL Audio 13W6v2 Foam Kits Now In Stock! Save Your JBL EON With A New 2414H Factory JBL Replacement Driver! Ferrotec ferrofluid kits are now in stock and ready to ship! You may be wondering what ferrofluid is? If you are curious about what ferrofluid is and how it works we provided this to explain. "Ferrofluid improves the performance of high frequency and midrange drivers. It works by damping the impedance at resonance to effectively lower distortion, smooth frequency response, and increase thermal power handling. It should be used to replenish drivers treated previously with ferrofluid. With care, it can also upgrade most drivers that have never contained ferrofluid. The kits listed are approximate fill quantities relative to approximate voice coil diameters. In general, the air gap should be 75% filled prior to inserting a voice coil diaphragm assembly. The kit contains synthetic ester-based ferrofluids and in most cases should not pose any adhesive incompatibility. It is recommended that this is confirmed by contacting the driver manufacturer prior to usage. Adding ferrofluid to a driver not intended for it will, in most cases, void the original manufacturer's warranty. Included in kit: A ferrofluid packet, absorbent paper strips for removing old ferrofluid, detailed instructions, and material safety data sheet. 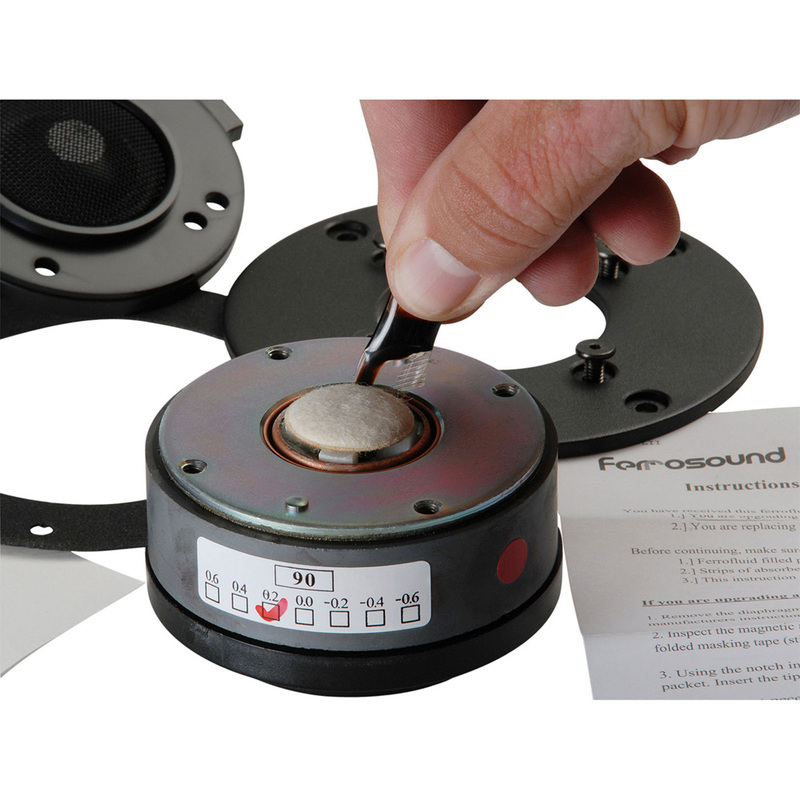 As the global leader in ferrofluid products, Ferrotec has been supplying ferrofluid to audio speaker manufacturers since the early 1970s. Ferrofluid enables audio speakers to function more efficiently, with improved audio response and better power handling. For audio speaker manufacturers, Ferrotec ferrofluid also provides significantly better speaker manufacturability for improved quality and higher manufacturing yields."